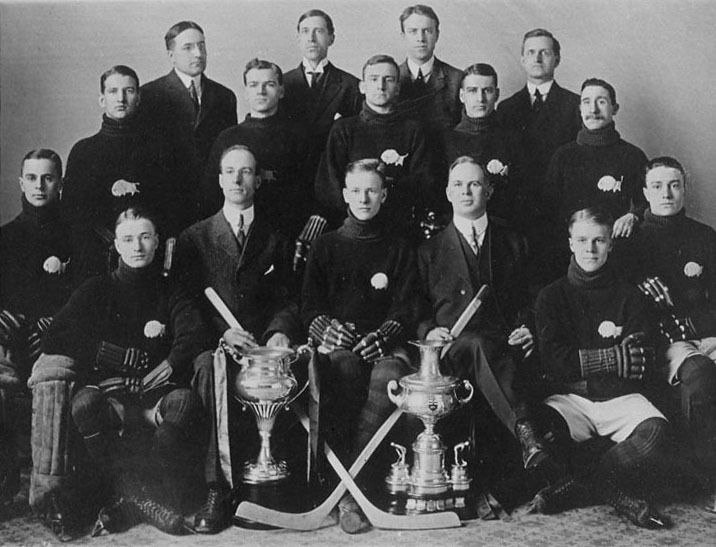 The Winnipeg Victorias defended The Allan Cup against the Toronto Eatons , Calgary and Regina.1912 Roster: Basil Baker (Goal), Francis Caldwell (Centre), J.D. Pratt (Pres. ), Les Moffat (Captain & Cover Point), Dan Bain (Hon. Pres. ), Hammy Baker (Right Wing), H."Corky"Fowler (Point), Charlie Belcher (Spare), W.R. Bawlf (Vice-Pres. ), G.A. Wickson (Spare), C.W. Nash (Vice-Pres. ), Fred Bawlf (Left Wing), Claude Robinson (Sec'y/Treas. ), Coo Dion (Rover), G.H. Stead (Asst. Sec'y), Harry Sullivan (Trainer).